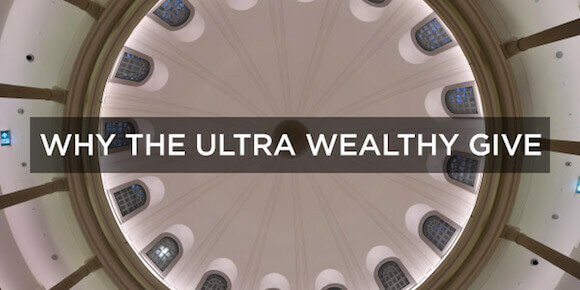 Wealth-X: Why Do the Ultra Wealthy Give? What motivates the ultra wealthy to give? Wealth-X conducted an Attitudes Survey in conjunction with Knight Frank to gain insights into the perspectives and behaviors of the ultra wealthy around wealth management, philanthropy, wealth transfer and more. The survey was based on the views of around 400 of the world’s leading private bankers and wealth advisors who, between them, manage assets for about 45,000 ultra high net worth (UHNW) individuals with a combined wealth of over US$500 billion. Although protecting their wealth is a preoccupation for many UHNWIs, giving much of it away is also important. Facebook founder Mark Zuckerberg and his wife Priscilla Chan made news last year when they pledged to give away 99% of their shares — currently worth US$45 billion — in the social media giant. On average, 67% of those who took part in the Attitudes Survey said their clients’ philanthropic activities had increased over the past 10 years, with almost 80% saying activity would increase further over the next 10. In contrast, only 2% of respondents predicted that UHNWI philanthropic activity would decrease over the coming decade, and 17% said that charitable giving would remain the same. Respondents were asked to select several main UHNWI motivations for giving wealth or time to charitable causes. Globally, the most popular driver of philanthropy was personal fulfillment, cited by 52% of respondents, followed by “a sense of purpose,” selected by 51% of participants. Rounding out the top 6 reasons for giving were “a sense of duty or responsibility” (48%), “to make an impact on others (36%), “to be remembered or to leave a legacy (36%) and “tax relief” (36%). Of the 13 motivations listed, the least popular were “opportunity to interact with their family members” (11%) and “to ensure their children’s financial independence” (7%). The regions with UHNWIs most concerned about “sense of duty or responsibility” in giving were Europe (60%) and North America (68%), compared to the global average (48%). North American UHNWIs are more likely to participate in philanthropy because it ties into their social activities, as cited by 42% of respondents in the region versus 23% globally. In the Middle East, the third most popular motivation for giving was religious beliefs (41%) — the highest value placed on that driver by any region. For respondents in Latin America, 25% said that the increased availability of advice on effective philanthropy was a key incentive for their clients, compared to the global average of 13%. Have you always imagined living in a home that has a bathroom that feels like your own personal spa and leaves visitors enchanted? Whether it’s a Zen retreat surrounded by boundless mountains or hidden within a penthouse suite overlooking the ocean, these modern bathrooms will stop you in your tracks. Presented by Sotheby’s International Realty Affiliates LLC. Whether you’re in the market for a summer getaway or an alpine escape, a property steeped in history or something with a modern twist, one of these five newly listed estates is bound to catch your eye. Nestled on a forested peninsula in southern Sweden, the opulently restored Fogelvik Castle sits on land that once belonged to a 15th-century king. Another pedigreed gem encompasses 50 lush acres in Yucatán, Mexico; currently a luxe bed-and-breakfast, the 17th-century Hacienda Katanchel was refreshed by architect Aníbal González and designer Mónica Hernández. 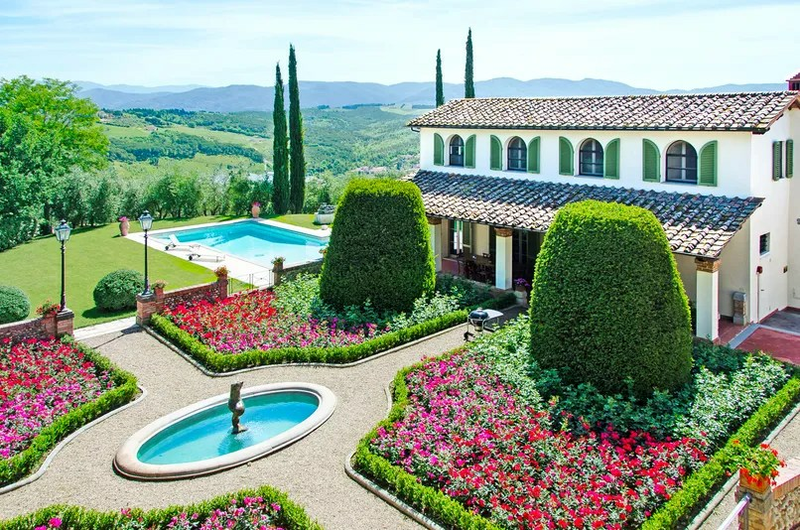 And in Tuscany, two storied parcels are being offered as one sumptuous 12-acre compound that includes a four-bedroom main villa, a 1647 chapel, and a studio that once served as the atelier of avant-garde Dutch artist Karel Appel. Meanwhile, two modern homes in the U.S. boast stunning designs by high-profile architects. In 2009, on a sprawling 105-acre spread just outside of Vail, Colorado, AD100 talent Annabelle Selldorf crafted a refined structure embellished with copper brise-soleil, masonry siding, and pine beams. 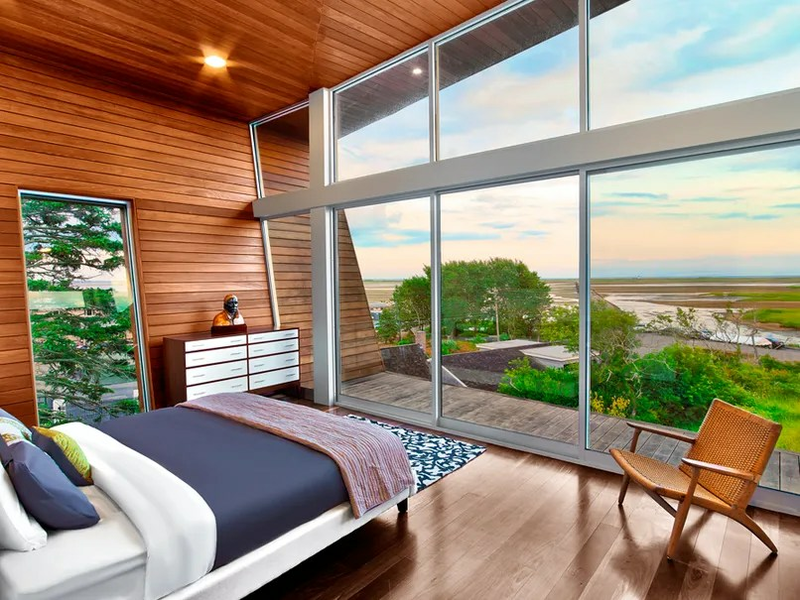 For the more beach-inclined, there’s a serene ipe-clad residence in Provincetown, Massachusetts, that was completed in 2013 by the esteemed New York firm Hariri & Hariri Architecture. 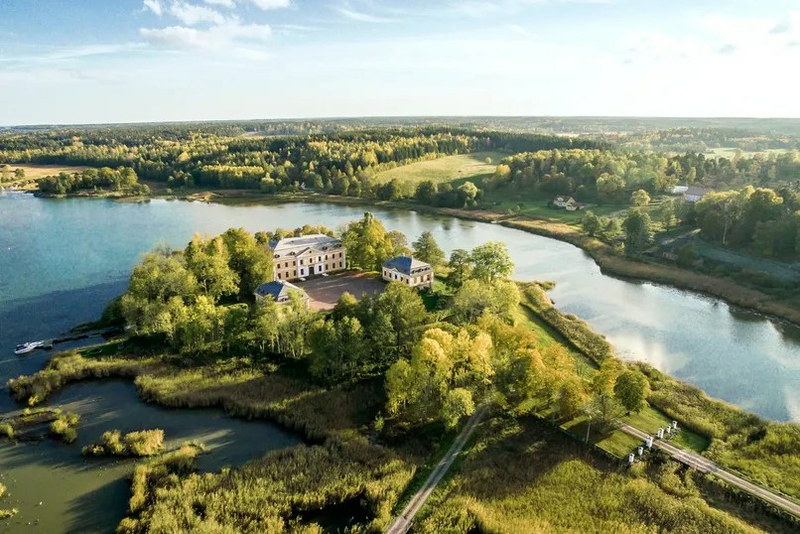 Set on a private peninsula some 140 miles south of Stockholm, historic Fogelvik Castle was designed in the 18th century by Carl Hårleman, the father of Swedish Rococo style, on land that in the 1400s was home to the country’s King Charles VIII. In 1995 the current owners undertook a painstaking restoration of the three-story castle’s period details, among them murals by artist Jean Baptiste Masreliez. The verdant three-acre property includes a pair of spacious detached wings—with guest quarters, a grand entertaining hall, and a sauna—plus a summer cottage. Photo: Courtesy of Christie’s International Real Estate/Agenzia Romolini Immobiliare S.R.L. Once a convent and later an agricultural estate, this impressive 13th-century Tuscan compound encompasses 12 rolling acres peppered with vernacular structures. The main villa, a meticulously refurbished beauty with its own watchtower, is joined by four outbuildings—including a 1647 chapel and an atelier that previously served as the studio of Dutch avant-garde artist Karel Appel—housing 23 additional bedrooms. An equestrian statue by Appel can be found on the manicured grounds, which also boast bountiful olive groves and a vineyard that yields some 3,000 bottles of Sangiovese and Chianti Classico each year. Perched high on a dune at the tip of Cape Cod, this 2013 house overlooks Pilgrims’ First Landing Park, the storied stretch of sand where the Mayflower originally docked in 1620. When conceiving the striking building, the Manhattan firm Hariri & Hariri Architecture looked to a more recent past, taking inspiration from the Bauhaus. (Walter Gropius designed the landmark 1959 residence next door.) Clad in Brazilian ipe wood and gray stucco, the two-story home features a dramatic asymmetrical roofline, double-height window walls, and a sleek glass-and-steel bridge connecting the bedrooms on the second floor. For the design of this 2009 alpine getaway—located on 105 pristine acres just outside Vail—AD100 architect Annabelle Selldorf took cues from the surrounding swath of White River National Park. Floor-to-ceiling windows frame the rugged landscape (the best views are from the three-level tower), while at the center of the dwelling is a lush courtyard that Selldorf envisioned as an intimate counterpoint to the sweeping vistas. To infuse her sophisticated aesthetic with a decidedly rustic edge, she used local materials, from fieldstone to copper to pine beams. 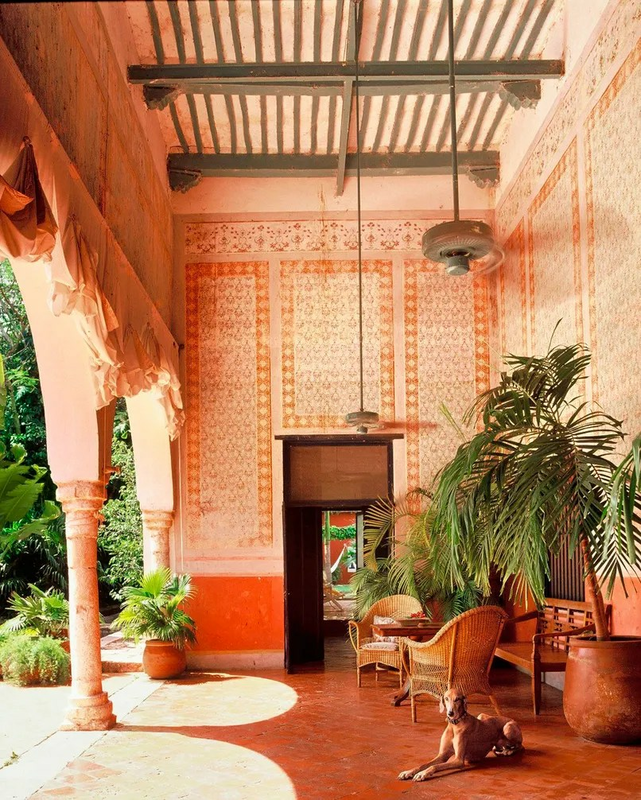 In 1996 Spanish architect Aníbal González and his wife, designer Mónica Hernández, purchased this former sisal plantation on the outskirts of Mérida and transformed the 50-acre property into a luxurious boutique resort. Christened Hacienda Katanchel, the sumptuous compound comprises a 17th-century manor, a lofty warehouse turned grand salon, and a whopping 33 guest pavilions, each with its own plunge pool. A private rail system services the fruit-tree-dotted grounds, which are just a short walk from Mayan ruins. Not long ago, the notion of eco-chic was a contradiction in terms. Green homes were associated with off-the-grid choices and environmentally conscious homeowners were viewed as pioneers. Options for melding style and sustainability were far and few between. What a difference a few years make. Now more people are asking if homes can be high performance, health and aesthetically pleasing. And the answer is an across-the-board yes. “The sustainable home marketplace is experiencing a monumental shift in consumer perception and understanding,” says Channing Boucher, broker associate of Benson Sotheby’s International Realty in Crested Butte, Colorado. Technology has reset consumer expectations and helped them realize there’s no need to compromise on creature comforts. “Today’s homebuyers are better educated about the opportunity and, therefore, place a higher value on features like improved indoor air quality, energy efficient electrical, plumbing and heating systems and water-saving equipment and appliances,” he says. The surge in environmentally friendly housing and landscaping is more than a trend. It’s a way of life. Homebuyers who once made decisions based on location, price and floor plans are inquiring about green elements as a fourth consideration. They realize the investment in technologies and materials will pay for itself. Green improvements change the economics. “As cost differentials for green-built versus conventional code-built homes shrink, the time horizon on the payback of the investment also shrinks, making eco-friendly homes more desirable and attainable,” Boucher says. One of Boucher’s listings, a ranch on a 35-acre lot on the edge of Crested Butte (pictured above), is a prime example of environmentally sound planning and construction. The ranch was the first LEED Gold-certified residence constructed on the state’s Western Slope. The LEED designation recognizes leadership in green building strategies and practices. The home is equipped with LED lighting and solar water panels for heat. Cabinetry and flooring are both made from reclaimed lumber. According to the U.S. Green Building Council, firms building new single-family homes report 15 percent of their projects are green, a figure that is expected to jump to 84 percent by 2018. The eco shift is global with homeowners and developers deliberating how they can retrofit existing homes or build smarter ones from the ground up. In one example of adaptive reuse, a series of centuries-old farmhouses in Tuscany, Italy, is being dismantled and rebuilt into modern residences using the original stones, wood beams and terracotta roof tiles. Repurposing the materials keeps them out of the landfills. These older materials are being supplemented with locally sourced new ones, including products certified by the Forest Stewardship Council, which ensures the lumber comes from responsibly managed forests. In the principality of Andorra, Narcís Socías, CEO Andorra Sotheby’s International Realtysays he’s seen increased interest in sustainable and energy-efficient buildings in recent years. “New construction of eco-friendly homes in the Pyrenees have three pillars of importance: economic, social and, most importantly, environmental. Renewable energies are being applied to the construction of new properties, adding benefits including maximum comfort and safety, potential savings and, of course, a lower impact on the environment.” An apartment for sale in the Andorran parish of Escaldes Engordany is in a south-facing building to take advantage of the sunlight, incorporates a home automation system to maximize energy efficiencies and uses solar panels for its electrical supply. Green building growth is being fueled by a number of factors, reports the U.S. Green Building Council including market demand, cost savings, health concerns and a boost in local, state and federal mandates. LEED-certified homes on market in the U.S. rose 9.7 percent from 2014 to 2015, according to the 2015 Global Luxury Residential Real Estate Report with Wealth-X. In fact, green-certified residential construction rose in every nation in Western Europe in the past year, while growth has been especially dramatic in China at 19 percent, spurred on by government incentives. The idea of a green home is not an all-or-nothing proposition but a scalable effort. Owners can incorporate as few or as many elements in their homes as they like. And they can be simple or complex: Employing rainwater capture systems, using native plants that thrive with minimal watering, installing satellite irrigation systems that monitor the weather and then adjust watering accordingly, incorporating renewable materials like bamboo and investing in geothermal heating systems. As the number of high end eco-friendly products on the market increases to meet the “responsible luxe” market, the learning curve in technology continues to decrease. Today’s touch-screen home automation systems are intuitive to use, simple to program and easy to navigate. And that makes it easier than ever for homeowners to make green both a practice and a goal. “It’s important for homeowners to consider sustainability in their homes design so that they be positive contributors to the health and happiness of their family and our planet,” says Barnard. The DISC is one of the top three fundraising events benefiting the U.S. Ski and Snowboard Foundation in the U.S.; current and future ski stars are supported in training programs from development to podium. This year’s DISC was hosted in Telluride March 2nd through March 6th. With 81 racers and 30 guests in the world’s longest running private ProAm ski racing event, this pro-am event invites world-class pro skiers to captain their amateur teams in a festive weekend of racing clinics, time trials, and races. A stronger dollar has propelled New York and Los Angeles into an annual ranking of the world’s 10 most expensive cities. Singapore took the top spot in the ranking from the Economist Intelligence Unit for the third straight year, followed by Zurich and Hong Kong. The survey compares more than 400 individual prices across 160 products and services, and volatile exchange rates have rippled through the survey. This means that even if the cost of living in, say, New York didn’t rise much for New Yorkers over the past 12 months, the survey will show that New York became more expensive because the dollar strengthened, raising prices of goods and services relative to other countries. Indeed, New York climbed to No. 7 on the list from No. 22 just one year earlier. It had been far as down as No. 49 in 2011, and it peaked at No. 6 from 2000 through 2002. Compared with New York, 106 cities saw living costs decline last year, while 16 saw a rise in the relative cost of living. Los Angeles was tied for No. 8 on the list. 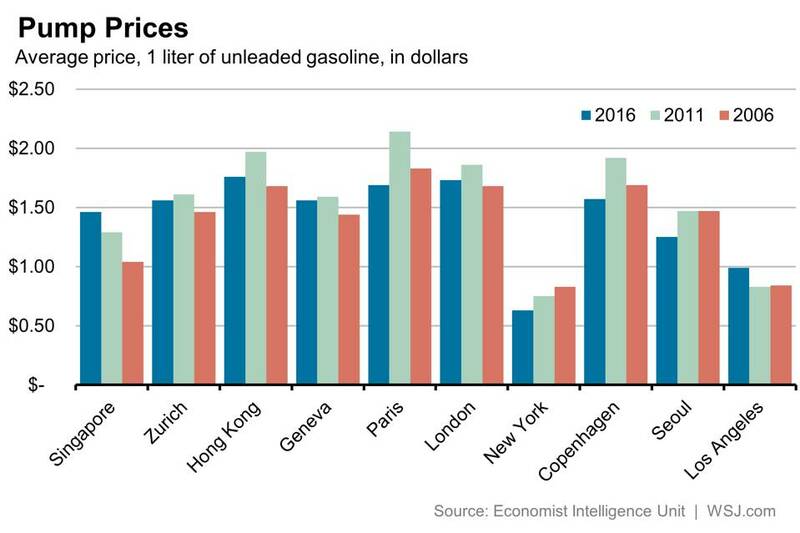 Other pricey American cities include Chicago(21), Minneapolis (24), Washington, D.C. (26), Houston (31) and San Francisco (34). One important caveat: The index includes the cost of household goods, clothing, food and transportation, but it doesn’t include the cost of shelter. This is a huge household cost, of course, which may make the ranking less meaningful. In any event, this helps explain why some expensive U.S. cities, namely San Francisco, don’t rank higher in the index. Of the 16 U.S. cities surveyed, Cleveland and Atlanta were the least expensive, with a cost of living that is 31% less than New York. 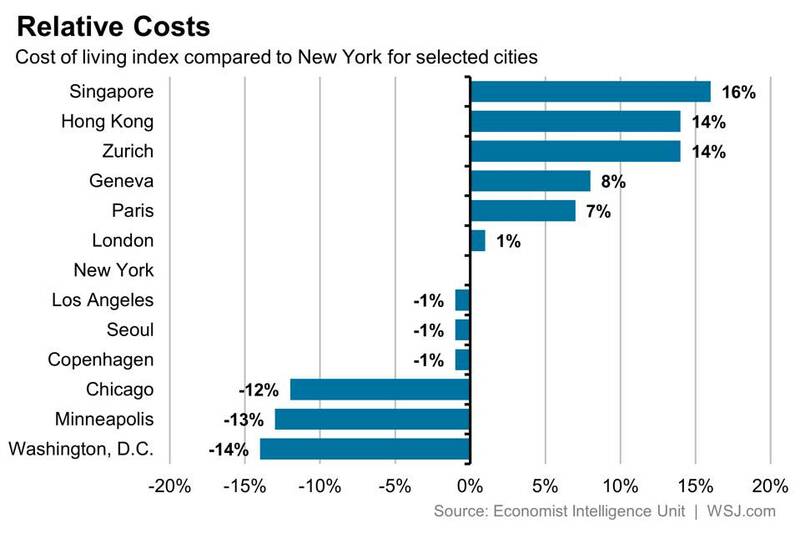 On average, New York was about 20% more expensive than other U.S. cities. 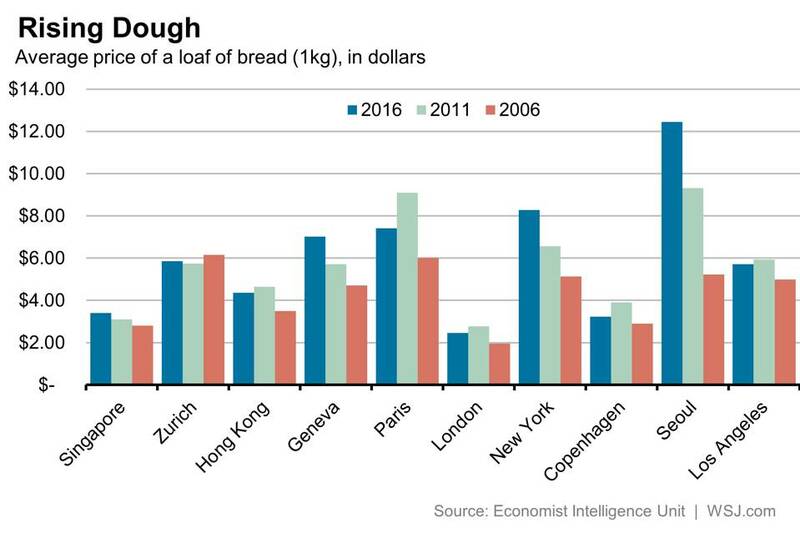 While the stronger dollar meant that the relative cost of living rose for most American cities last year, all 28 cities surveyed in Western Europe saw cost of living declines compared with the U.S. In Russia, the collapse of the ruble caused the cost of living inMoscow and St. Petersburg to decline nearly 40%. A summary of the full survey is available online. Bill Jensen reveals big plans for Telluride ski resort’s future.